Kitchens and baths completed by Classic Kitchens & Interiors have been published in numerous local and national publications. We take a look back at the last eight years of publication history. Chatham Magazine, “Commanding the Land,” Laurel Kornhiser, 2011. Cape Cod Magazine, “Celebrating Cape Cod Women,” featuring Becky Brown, March 2011. Cape Cod Home, “Seaside Stylish,” Susan Dewey, Winter 2010. Home Remodeling, “Additions Large and Small,” Rob Duca, Summer 2010. New England Home Cape & Islands, “All Season’s Greetings,” Megan Fulweiler, Summer 2010. Cape Cod Magazine, “Tour of Kitchens,” Jessica Laniewski, March 2010. Home & Architectural Trends, “Far Horizons,” Colleen Hawkes, August 2009. Cape Cod & Islands Home, “On the Coast,” Jill Evarts, Summer 2009. Cape Cod Magazine, “No Walls Needed,” Laurel Komhiser, April 2009. Cape Cod & Islands Home, Special Issue 2009. Cape Cod Magazine, January/February 2009. Home Remodeling Cape Cod, the Islands, & the South Coast, Fall 2008. Cape Cod Magazine, September/October 2008. Cape Cod & Islands Home, Early Summer 2008. Cape Cod View, May 2008. Veranda, “Cuisine Quarters,” Deborah Sanders, November/December 2007. New England Home, “Meet the Designers,” September/October 2007. New Home, Better Homes and Gardens Special Interest Publication, “Revisiting the Cape,” Maria LaPianna, Fall/Winter 2007. 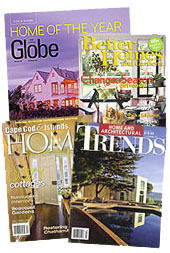 New Home, Better Homes and Gardens Special Interest Publication, “Revisiting the Cape,” Fall/Winter 2007. Cape & Islands, “Showcase,” Summer Special Issue 2007. Chatham Magazine, “King of the Harbor,” Laurel Kornhiser, Annual 2007. New England Home, “Meet the Kitchen Designers,” May/June, 2007. Boston Globe Magazine, “Home of the Year,” John Budris, December 3, 2006. Cape Cod & Islands Home, “Strokes of Brilliance: Chocolate,” Holiday Issue 2006. Inside Cape Cod, “Cottage by the Sea,” Early Summer 2005. Cape Cod View, March/April 2005. Cape Cod Magazine, September/October 2004.